Although this begs the question, “Why engage in a three-year retreat, when you could just sit and spin a Dharma Wheel?” — that’s not the point. It’s not permission to be lazy. It’s permission to practice everywhere, more often, for the benefit of all sentient beings. This is why you see great teachers such as H.E. Garchen Rinpoche, at a Highest Yoga Tantra commentary on Vajrayogini, spinning the prayer wheel as he speaks. The spinning doesn’t ever stop — for the benefit of all sentient beings. H.E. Garchen Rinpoche with student Micha Strauss, a maker of hand-made prayer wheels, with a personalized prayer wheel. If so, then, why engage in, for example, advanced Phowa practice, when the sacred texts say you can place the prayer wheel at the head of a dying person with the same effect? In that case, the answer might be Phowa practice can be difficult for someone in pain who is passing away. Then, why retreat to a cave for three years, when you could sit in the comfort of home with a prayer wheel? Of course, the obvious answer is that the practices are different and complimentary. The prayer wheel is NOT about “loafing off” in practice. It is about providing meaningful opportunities to practice more often — not less often — and with more “multiplied” effect — and to engage in Compassion (Metta), Karuna (Loving Kindness) and Bodhichitta everywhere. Even sitting in front of the TV, or chatting on Facebook can become opportunities to practice if you have a handy prayer wheel. For this reason, a Highest Yoga Tantra practitioners might spin the wheel while reciting mantras during an intense visualization practice. Yogis might spin the wheel “attracting the Dakinis and Protectors” and gaining help attaining the two accomplishments. Monks can purify serious breaches of vows. And everyone could use a little healing. Traditional meditation at a nunnery with traditional wheels. 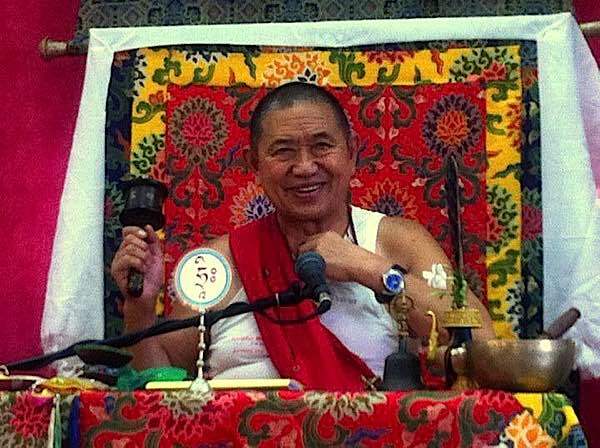 Phackchock Rinpoche using a prayer wheel from Galgami at a teaching. Waiting in line? On a coffee break at work? Sitting at home with the power out due to the latest snow storm? Pull out your portable Dharma Wheel and spin. (Today, Mani Wheels are made in many formats and styles: tiny pendant spinners (with thousands of mantras), small, medium, large and massive hand spinners, table wheels, water wheels, wind wheels, to giant temple-sized wheels with hundreds-of-millions. 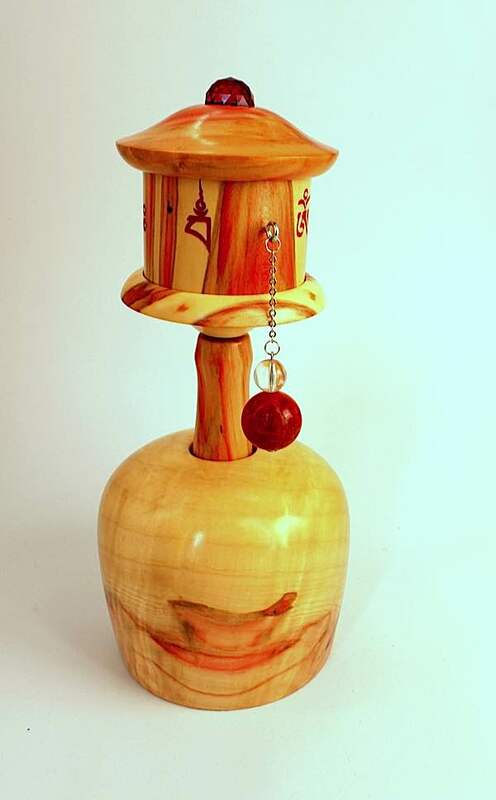 Portable prayer wheels, small enough for a purse, man bag or shoulder bag are available, and with almost any mantra. In ancient Tibet, farmers used to plow their fields while spinning their Mani Wheels, and people carried their wheel with them to the market, to work, almost everywhere. 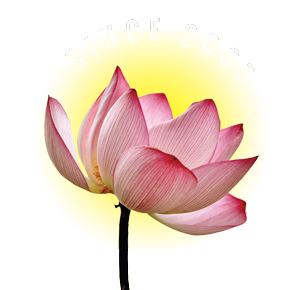 What could be more deal for those struggling with higher practices (for example, being unable to fit in the hour-long sadhana) — those with limited time, busy lives, and those who engage in Bodhichitta, Metta and Karuna practices. That’s pretty well all of us (at least, most Mahayana Buddhists.) This is why you see many of today’s teachers, and notably H.E. Garchen Rinpoche, with prayer wheels in hand. It may be ubiquitious, common and easy, but that doesn’t make it less effective. Mingyur Rinpoche in front of giant temple prayer wheels filled with millions of mantras. It’s easy to analyze this and assume, “oh, the great teachers say that because it’s better to do a simple practice daily and perfectly, than to give up on a higher meditation you can’t master.” But, it’s not that simple (pun intended.) Prayer Wheels get a bad rap that way. They’re not simple tools for non-Dharma practitioners who are busy with mundane lives and can’t focus on a long mantra retreat. Their practice may seem simple, but there’s a sophisticated elegance that is often missed. There’s nothing sophisticated about a practitioner with dozens of Higher Yoga initiations, who never finds time to master them. Spinning a traditional prayer wheel. “To many pratitioners, mantra recitation, mala, retreat and visualization are the ultimate practice — especially for those who practice Highest Yogic practices. 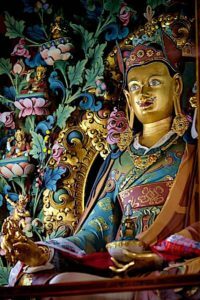 Yet, according to many great teachers — from Padmasambhava Guru Rinpoche, to the fourth Panchen Lama, to long lineage of great teachers — the practice of spinning the Dharma or Mani Wheel is more effective than recitation alone. 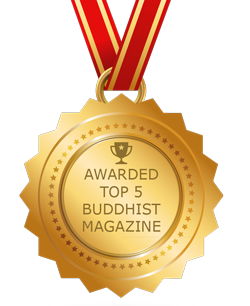 It has been called the ultimate “Bodhichitta” practice, since it’s intention is entirely about benefiting all sentient beings. Using the colourful language of the texts, Amitabha said, “Anyone who recites… while turning the Dharma Wheel a the same time is equal in fortune to the Thousand Buddhas.” This is colourful English translation, meant to convey the vast benefit. Is it just because Higher Practices often take a lifetime to master (or several lifetimes), while the profoundly simple and effective Dharma Wheel practice can be started today, with benefits for all sentient beings immediately? It’s clearly more than that. Like mindfulness meditaiton — which is easy to explain, yet so hard to practice — Dharma Wheel practice is complete and sophisticated. H.E. Garchen Rinpoche spinning a Dharma Wheel at a Higher Yogic teaching on Vajrayogini. 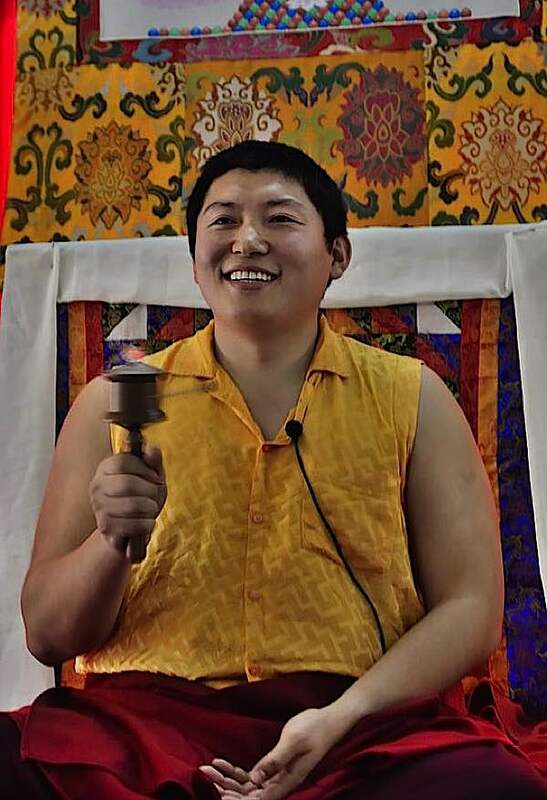 Garchen Rinpoche is famous for compassionately spinning the wheel everywhere he can. According tob all the great teachers and many translated texts, the benefits or turning the wheel are greater than mantra recitation alone. Keeping your prayer wheel by your side is well advised. It is, perhaps, no wonder, that you see traditional Tibetans turning the wheel even as they walk down the street. H.E. Garchen Rinpoche famously spins a prayer wheel almost everywhere, even at formal teachings. Temple and centre large prayer wheels are popular — and in pilgrimage areas can have a line up. This is the simplest practice. 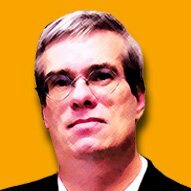 If you are spinning while doing other things — such as H.E. Garchen Rinpoche when he is teaching — this is still of benefit. It’s multitasking for the benefit of all sentient beings. Lama Zopa Rinpoche recommends a thousand mantras a day as a good guide. He advises each set of 100 spins be dedicated to the merit and benefit of a group of beings. For example, 100 for humans. Another 100 for animals, especially focusing on those who are hunted and slaughtered. You could even decdicate a hundred to your own practice, another 100 to healing, another 100 to removing specific obstacles. Intention is important. As with all Buddhist practices, it is best to start with Taking Refuge in the Three Jewels and ending with a dedication for the merit of all sentient beings. 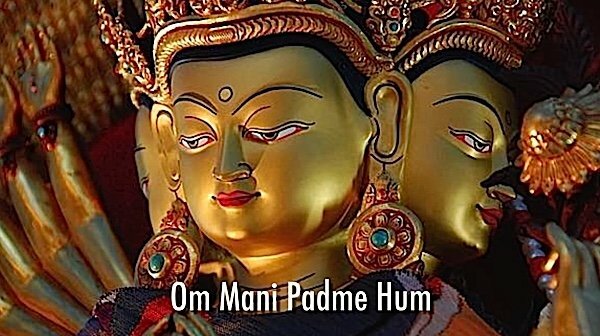 Om Mani Padme Hum, the great compassion mantra of Avalokiteshvara. One of the author’s custom made prayer wheels, this one with Hayagriva and Vajrayogini mantras, created by Shea Witsett at The Prayer Wheel Shop. The entire practice, a complete Body, Speech and Mind practice, includes the physical act of spinning (Body), the mental aspect of visualizing (Mind: imagining healing light going out to all beings) and voice (Dharma) — both actually spoken, if recited, and in the form of millions of mantras inside the wheel. More importantly, each of those activities is dedicated to the benefit of all beings. The wheel rotates millions of mantras (depending on the size, it could be hundreds-of-thousands, or even hundreds-of-millions in the temple wheels — sending out the Mantra’s blessings. According to Lama Zopa, H.H. Dalai Lama, Geshe Rabten Rinpoche (a great yogi and scholar) and other great teachers have personal prayer wheels. A big advocate of their use was H.H. 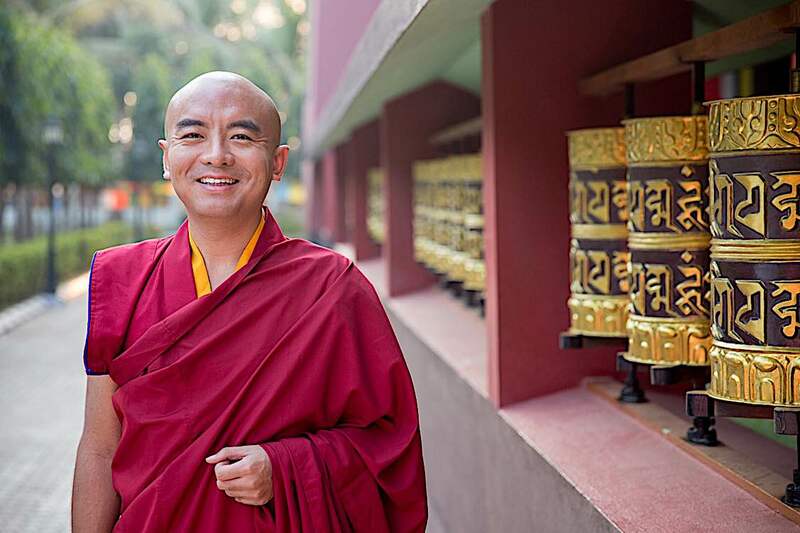 Trijang Rinpoche — the root guru of many Gelug lamas, including Lama Zopa, Zasep Rinpoche, and many others — who was also an early tutor of the Dalai Lama.